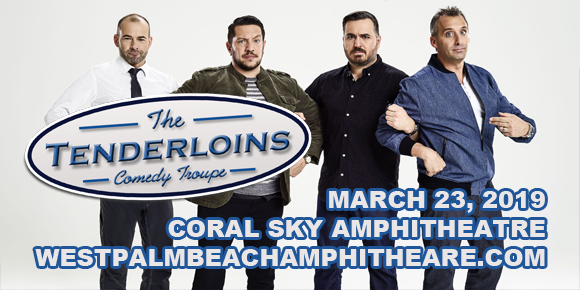 The Tenderloins are once again bringing their laugh-out-loud comedy stylings to Coral Sky Amphitheatre on Saturday 23rd March 2019! The comedy troupe, stars of truTV’s hit series Impractical Jokers, are bringing their riotously funny sketch and improv comedy to the stage once more in an all-new show dubbed the Cranjis McBasketball World Comedy Tour! You never quite know what to expect with these goofball pranksters, but one thing you CAN be sure of – it's gonna get ya right in the funny bone! The Tenderloins is an American sketch and improv comedy troupe that began in 1999 and is currently composed of Joseph "Joe" Gatto, James "Murr" Murray, Brian "Q" Quinn, and Salvatore "Sal" Vulcano. The group originally made its name in the early 2000s performing live comedy, but later turned its attention to sketches, which were filmed and broadcast to the public via YouTube, MySpace, Metacafe, and other websites, accumulating millions of views. In 2007, the troupe won the NBC It’s Your Show competition for the sketch "Time Thugs", receiving the $100,000 grand prize. Their online success soon led to a television deal for a scripted comedy pilot with Spike TV based on the comedians' own lives. Although the show never materialised, in 2011, truTV announced Impractical Jokers, a new series executive-produced by and starring The Tenderloins. The show was renewed for an eighth season in March 2018, has produced three spin-offs (Jokers Wild, Inside Jokes and After Party) and will be the basis of a feature-length movie, due for release in 2019. The Tenderloins also have a radio show and podcast.